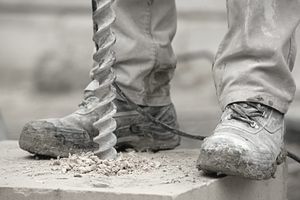 Good work boots are an important consideration for construction workers and one that really cannot be stressed enough. There is a process of finding the right one, and there are numerous considerations that should be made prior to purchase. Choosing the right one is about much more than simply protecting your toes. Depending on the type of work you do, it is important to select boots that offer various protections, including resistance to slippery surfaces, cold temperatures, exposed nails, and electrical charges, just to name a few. On top of that, there is the consideration of comfort. There is only one thing worse than being on your feet for hours on end, and that is being on your feet wearing improperly fitted and uncomfortable boots. Feet need good support, and the wrong boot can lead to problems down the line. Here are a few recommendations we can make based on some of the most important criteria, like durability and ​safety. With an almost 30-year history of quality and durability, the Titan 6" 26078 is one of America's true classic work boots. It is also among the manufacturer’s best-selling boots of all time. It is praised as being very comfortable and features the company's signature Power Fit Comfort System that is designed to provide the best possible support for key parts of the foot. There is practically no breaking-in time with these boots. They can go directly from the box to the worksite and be completely comfortable from day one for most wearers. The aluminum alloy safety toe offers protection as strong as steel at close to half the total weight. Titan's soles are slip-, oil-, and abrasion-resistant as well. These boots also feature virtually unmatched durability. One pair often lasts two full years even with grueling daily wear. The company offers a full refund within 30 days with no limits or restrictions on the amount of wear if you aren't completely satisfied. These lace-up boots are rugged and stylish and are consistently rated high in quality and durability. They stand up well to even the most extreme of work conditions. They feature a 5 Iron Texon insole that provides superior support for the entire shoe and a thick leather upper that provides excellent protection against nails or anything else that could penetrate lesser-quality boots. Despite the iron construction of the insole, these boots are still very comfortable. They have a cushion insert that helps maintain comfort for hours at a time. The sole is also very flexible, which allows the foot to move naturally and provide a good degree of shock absorption. They also feature a rounded toe design that allows ample room for your feet to move. Wolverine boots are known for being very comfortable as well as durable, and they include the company's exclusive Multishox Comfort System – a series of outside pressure pads and comfort gel insoles. They offer a contour welt design that provides the soft, comfortable cushioning of a sneaker paired with impressive durability. Very flexible and comfortable from day one. These boots are also abrasion-, slip-, and oil-resistant and remarkably breathable for waterproof boots. They aren't that well insulated, though, which makes them a less-than-appealing choice for colder working conditions. For those who like a bit of style in their work boots, the tanned leather construction of these boots is a huge draw, as is the white cotton interior lining. They are higher than the average work boot, but that height also offers added ankle support. Very breathable, which makes them great for working outdoors in the heat of summer or in other particularly hot conditions. They feature shock-absorbent soles and comfort inserts. No breaking-in period here – just comfort and quality from day one. Made of high-quality leather, these boots are built to withstand the test of time. It takes time to break them in, but after that, they are exceptionally comfortable. The sole has distinct ergonomic features to help make them even more so. So named because they are suitable for after-work wear and are offered in a variety of colors. If you work in wet conditions, however, these might not be the best choice, as they do tend to get wetter and stay wetter longer than average.